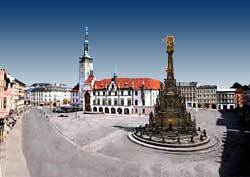 The old section of Olomouc boasts one of Europe's most attractive historical cityscapes. Another part of the city's appeal is that life goes on at a slow, relaxing pace (partially because it has not yet been fully discovered by tourists). This 250 year old carved stone column soars 35 meters or 115 feet (see picture's foreground). It is one of the most elaborate and best preserved Baroque columns existing in Europe today. The Upper (and Lower) square is adorned with 17th and 18th century fountains. It commandingly sits in the middle of the square (see photo's background). It is a convincing half century old replica of the earlier 15th century Gothic city hall that stood in the same spot. The Old Town Hall's exterior wall is adorned with oversized 15th century style astronomical time pieces. At noon, knee-high statues representing various trades carousel above those embedded wall tickers, to the delight of tourists who assemble to view this midday event. The square is surrounded by interesting baroque buildings painted with various pastel hues.